The Key to Saving for Retirement? 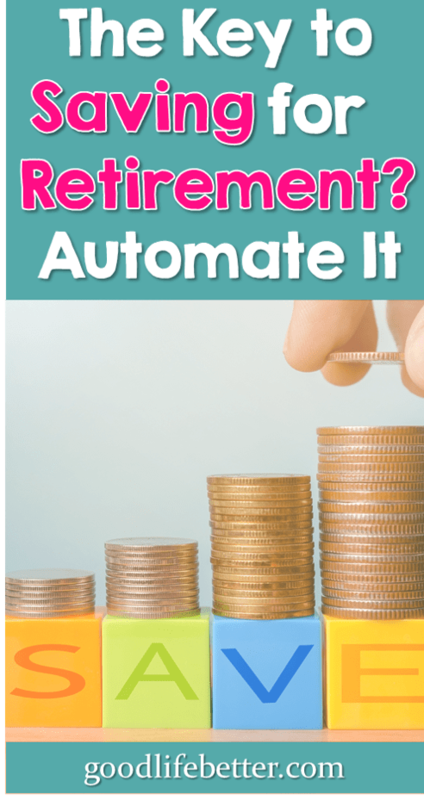 Automate It | Good Life. Better. One of my favorite writers on habit change, Gretchen Rubin, often says that what we do every day matters more than what we do once in a while. To illustrate this point, she gives the example of the person who will train for and run a marathon, but then never run again. On the day of the race, they may be in the best shape of their lives but if they don’t continue to exercise—even at a lower level of intensity than would be required to train for a marathon—they will soon be out of shape again. I think this concept applies equally to saving for retirement. I don’t know about you, but I don’t usually have $5,500 sitting in my bank account on any given day that I can transfer to my Roth IRA and thus max out my contribution for the year. But I may be able to find $458 a month, or $211 per paycheck (I get paid 26 times a year) that I could contribute so that over a period of 12 months, I will have achieved the same results. That is the beauty of making regular contributions: what we contribute every week or month can add up over time and push us closer to achieving financial security. This means it doesn’t matter if you operate on a 2-week or 4-week time horizon when it comes to your money—and if this describes you, believe me you are not alone. You can keep doing so and succeed in accumulating a nest egg. In (Money+Shopping+Food+Career) Rules to Live By, I wrote about how I have adopted several bright line rules to make my life easier. Why? As I explain in the post, I do this to combat “decision fatigue,” a term researchers use to describe why our ability to make good decisions declines throughout the day. When we make decisions, we call upon a reservoir of energy that is finite. If we reduce the number of decisions we have to make, we increase the likelihood that the ones we do make will be better. This is what I have attempted to do by establishing rules I live by. If we apply this phenomenon to money, it’s easy to see how reducing the number of times we have to decide to save instead of spend increases the likelihood of us saving. There is no longer a tug of war between immediate or delayed gratification—although I would argue that there is immediate gratification from saving too. It turns out that banks and financial institutions really want our money, and have made it ridiculously easy to ensure they keep it. Every company I have worked for that offered a retirement plan had some way to contribute automatically so that the money came out before my paycheck hit my bank account. My current employer, for example, allowed me to invest—and matched my investment up to 5 percent—from day one. A previous employer required I be there for a year before I could invest. This is less than ideal but when the time came, they did contact me to ask if I wanted to start contributing. If you are not sure what your company offers, please contact your human resources department and ask. Hopefully, they will be helpful but even if they aren’t, don’t give up. This opportunity to invest is too important! You can also set up automatic transfers to your individual retirement accounts. These are a little trickier because you “see” the money first: your paycheck hits your account and then the transfer occurs. If you are worried that there could be a problem with this arrangement if something were to happen and your paycheck was delayed, there are work-arounds. What I liked to do is have the money automatically transferred from my checking to my savings account and then once a month, the company where my IRA is invested withdraws the money from my savings account. This gave me a buffer in case something crazy happened but still got the money out of my checking account reducing the risk I would spend it. A few years ago, my bank offered a program where they would automatically transfer the difference between my debit card purchase and the next whole dollar amount to my savings account. So, for example, if I used my debit card to purchase $22.25 worth of groceries, my bank would automatically transfer 75¢ from my checking to my savings. You wouldn’t think this could possibly make a difference, right? Since I signed up, $1,262.50 has been transferred. Yep–over $1,000! If your bank doesn’t offer this, there are stand-alone programs you can sign up for. I haven’t used them personally but I know Acorns offers this same service. Check them out! 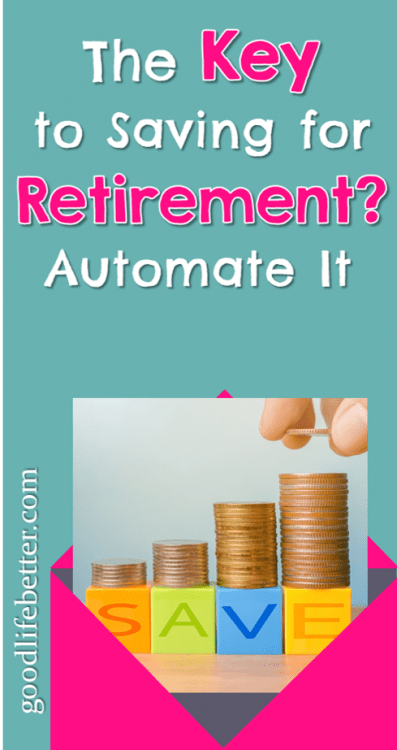 As I have mentioned several times on this blog, I have been contributing at least 10% of my income toward my retirement since I was 28. I didn’t always make the best decisions with money outside of this one, but this one decision has made a huge difference. In the initial years, when I was making between $25,000 and $35,000, 10% didn’t equal a lot. But overtime, my contribution grew as I made more money. And as I made more money, I increased the amount I was contributing to 12% and even higher. Now in my early 40s, my workplace retirement accounts are looking pretty good. I don’t have the exact figures but from what I can piece together it took about nine years of this regular investing for the balance to reach $100,000 (which includes the years of the Great Recession) but much less time to double that amount to $200,000. Once I am debt free, I plan on really cranking up my contributions and am genuinely excited about what this means for my future. Usually at the end of my posts, I ask my readers to let me know what they thought about it in the comment section below. 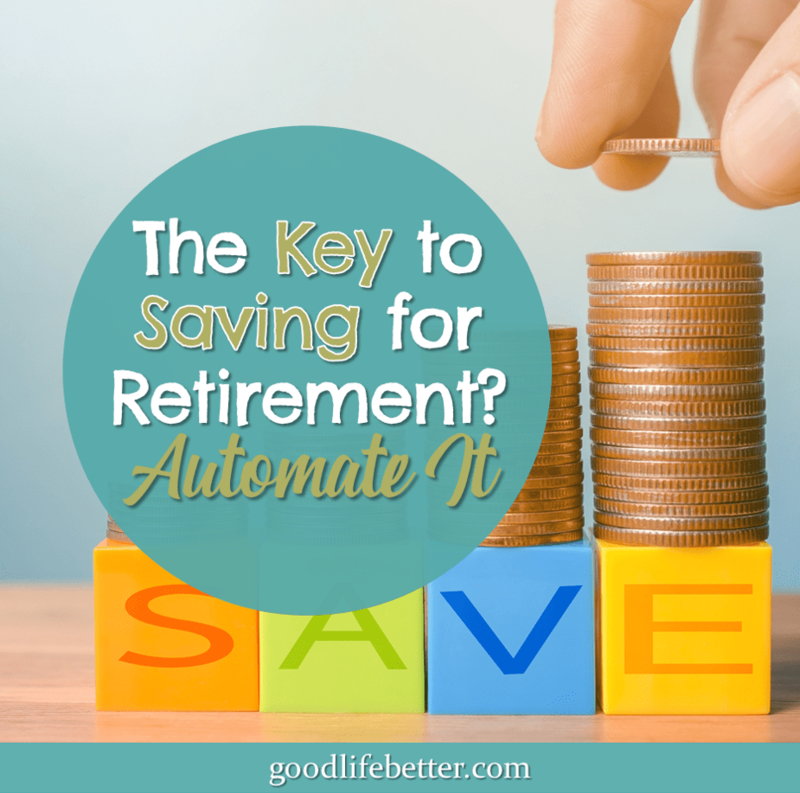 For this post, however, what I want you to do—even more than leave me a comment—is to identify a per paycheck savings goal. Maybe 5% of your take-home pay? Once you have that number, log into your bank account and set up an automatic transfer from your checking account to your savings account to occur each payday for that amount. Ultimately, your savings account may not be the best place for this money but for right now, I want you to resist the urge to check the balance of this account for at least six months. Let automation do its job and just pretend that this account is off limits (you can even visualize green laser lights blocking your access if that works for you!). At the end of that six months, check the balance. Then, marvel at how wonderful it is that you have started saving for retirement and are on your own path toward financial security. This post supports America Saves Week, an annual event to encourage Americans to establish savings goals and to reduce debt. You can learn more about America Saves at americasaves.org.